Geological setting is considered promising with structural features crosscutting the Opatica-Abitibi Archean suture zone. It has polymetallic potential owing to the presence of several, as yet non-tested, geophysical conductors. Size: A total of 157 claims covering an area of approximately 86.81 km2. Location: In the area targeted for resource exploration by the Quebec government (Plan Nord), the property is 100 km east of Mattagami and benefits from year-round access. 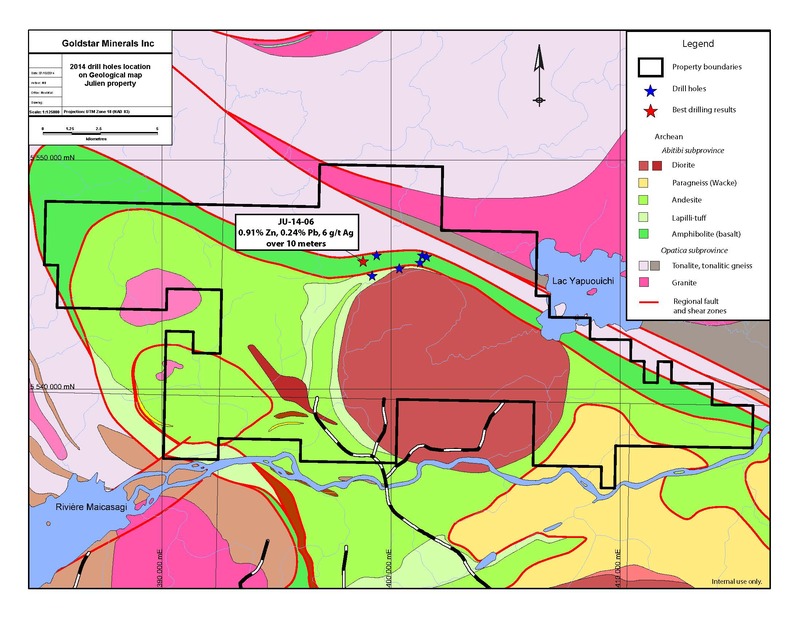 Volcanics-sediments contact that has yielded prolific gold production through the years in the Abitibi greenstone belts with the objective of discovering a large open-pit deposit. Size: A total of 1,243 claims, 100% owned, covering an area of approximately 671.39 km2. Location: The Assinica Gold Property consists of an almost continuous claim group that stretches over a distance of more than 100 kilometres, oriented East-West, from the Chibougamau area to the east of Matagami, Quebec. Access to the property is excellent all year round and is relatively close to existing infrastructure.